We wormed the flock earlier this week and today we trimmed hooves. Usually trimming is physically challenging: herd the sheep into a corral, catch one, turn it over and restrain the moving leg and trim hooves as the sheep sits back on your legs. Fortunately I borrowed a sling chair from Caroline at Owen's Farm in Sunbury, PA earlier this week. 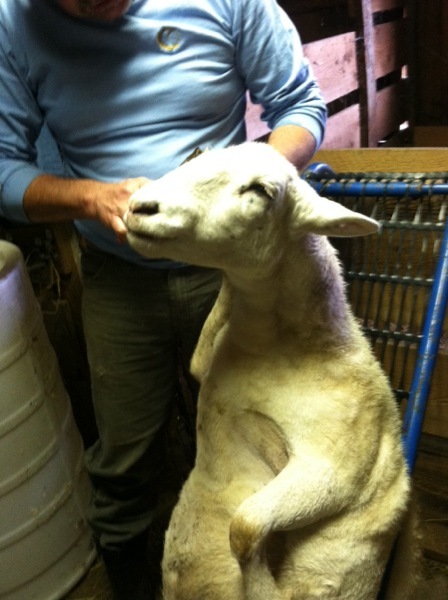 Instead of flipping and resting the sheep on our legs, we backed the sheep into the chair. Secure within the sling seat, the sheep were relatively still. In addition to trimming I made sure the gland between the toes (sheep are cloven hoofed, the hoof is split into two toes) was clear. The new ewes we purchased earlier this summer were ear tagged too. Ear tags are a mostly permanent way of identifying sheep. Record keeping is an important tool in building a healthy flock. Armed with data I can select the most successful sheep on our farm with an eye towards reducing worming medications and birthing complications and increasing butcher weights and overall vigor. I say mostly permanent because my oldest ewes have lost their Lilac Hill tags. Their original farm tags are still intact. I may purchase the more secure tags in the future. On Lilac HIll Farm, I ear tag the ewes on the left ear and the rams and wethers on the right. With the left/right tagging, I can identify the girls and boys from afar. Why left=girls/right=boys? I am the only leftie in the house so it makes sense to me. Because well trimmed hooves are so important to the well being of our pasture raised and bred sheep, I view this as the beginning of our lambing year.